Tell someone you collect old phones and the almost immediate response [besides the queer look] is, "You mean-like-the one's with the dials?" dialing gesture made by unknowing individual. "Sure, anything older than the 70's and made in America." 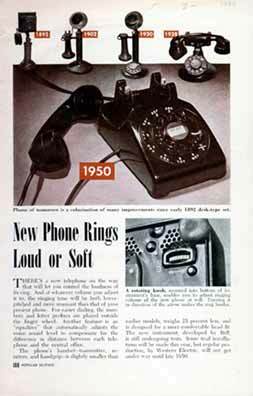 And thus begins an education for someone who might not have thought of a dial phone in a while, a person who many never have dialed one, or a trip back into the past for those who knew phones before dials were ever invented. Phones are my way of looking into the past and remembering happy events from my life, or-if you think about it-sharing a past that my grandmother shared [or maybe someone else's]. Imagine touching the same wood wall phone that your great-grandfather used on the farm. Ever noticed a certain aroma when you walk in a room full of old phones or radios or the like? Can't you imagine the house that phone served, the business that it enhanced, the things that were said over it's miles of line? Some people poo-poo my hobby, but maybe those are the people who don't have time for anything but work, worry and die. While this might be a habit forming pass time at least we phone collectors aren't known to go on benders and end up on the evening news for less than glorious reasons. P.S. Want to see some of my phone collection? 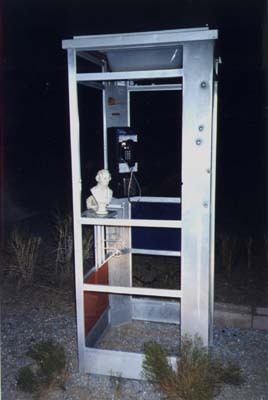 Just enter the phonebooth! This Antique Telephone Collecting Ring site owned byThe Phonelady.